Asour VPC-1000 Multimedia Hub for an evaluation. smaller spaces. When the item delivers as promised, and performs all of the tasks it’s designed to do well, more often than not, it’s a winner. it’s attractively styled and flashy. rough around the edges, and some that are flawless. Over the next few pages, we’ll see what is and isn’t, and I’ll relate my thoughts on them. 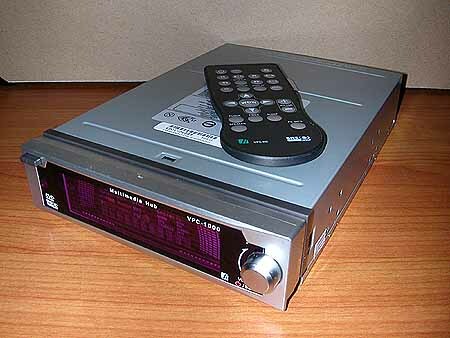 In the simplest of terms, the VPC-1000 is basically a modified 16x/48x DVD-Rom, with a fold down faceplate reminiscent of a new car stereo attached to the front of it. SRS Audio Processor: Stereo, SRS WOW, SRS Trubass, SRS. OS Compatibility: DOS (Separate device driver needed), Windows 95/98/SE/ME/2000/XP, OS/2 warp, Novell, SCO Unix, Linux. Operates independently of the PC, meaning it can be installed/configured to run even if the PC is powered off. Let’s take a look at what’s in the box, and I’ll elaborate further on how it can do this later. 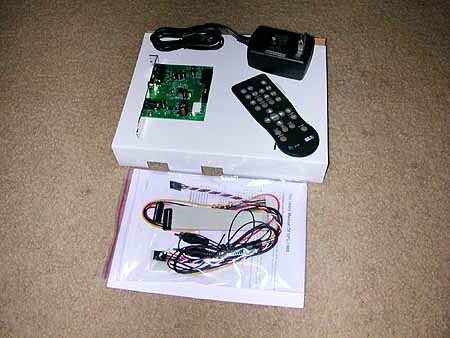 that runs the radio, the remote control, a bag with all the required cables, and an instruction/installation manual. points they were trying to make in the instructions. This in turn added a small amount of guesswork to hooking this unit up, which is unfortunate. with the build quality of the item, or it’s functionality, it’s disappointing to have to guess at some of the installation instructions on an item like this. to mount the drive with. quite good you’ll have no problems hooking these cables up. As I mentioned above, this internal power cable is optional. You can either use this cable (in conjunction with the AC adapter), or run the optical drive and radio directly off you PC’s power supply. If you do the former, this is how the unit can operate independently from the PC. If you power the drive from your PSU, you need the computer on to operate all functions of the unit. plugs into the speaker output of your sound card, the other into the input jack on the expansion card. radio reception suffers somewhat. 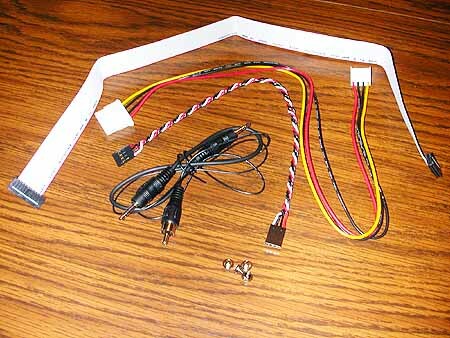 A longer antenna lead would greatly improve reception. It ships with a thin sheet of plastic covering one side of the battery (barely visible above, on the right edge) to prevent it from discharging between manufacturing and purchase. Top, across; Rear In, Rear Out, Antenna, and DC 12v. would connect to the “out” jack on the card. These are the only speaker jacks available. Bottom, across; 4 pin power socket (only used with AC adapter), 20 pin data cable socket, “SPDIF Output”, and “CD Digital Output”. and the 4 pin one mirrors a standard analog connection. The back end of the drive itself differs only with the deletion of the two standard audio ports (2 pin digital, 4 pin analog), and the inclusion of the 20 pin ribbon cable socket. so that the faceplate sticks out slightly if needed. case covering the drive bays would not close fully. Something to bear in mind, if your case has a door similar to this case, or you use a Chieftec/Antec/similar case. I eventually just removed the door until I finished with testing out the VPC-1000. Here you can see how far I had to mount it sticking out. Those drive rails hurt me this time. The faceplate uses a four-color vacuum-fluorescent display. display, that shows several different messages depending on what is turned on/off. and would need to be reset every time you turned the PC back on. If they incorporated a standard CMOS battery into the circuity, I’d imagine the time could be saved similar to how your BIOS settings are. When the radio is on, the station is displayed, as the volume level is changed, this gets displayed, when the radio is off and the computer is on, this displays “PC SOUND”, and so forth. function as a “graphic equalizer” of sorts, as the radio is on, with each end showing the output for the left and right channels respectively. Lots of settings to play with can be seen here. I took this picture while playing a DVD. Note the “equalizer” bars on the ends. Listening to the radio, with a CD in the drive. Seriously, “P01” means “Preset #1”. The VPC-1000 is capable of storing several preset radio stations, similar to how a car stereo would. The round CD indicator uses two colors, which blink on and off in sequence, resembling a turning disk. Neat. high end car stereos do. This would have been a real nice feature, but would have also been difficult to implement, and likely cost prohibitive. with the faceplate closed, it will not open (and could perhaps damage the drive if done repeatedly, as the tray strains trying to open with the faceplate closed). Once the tray is open, there is no button to push to have it close. You have to push the front of the tray in, until is starts to automatically retract closed. By and large, I was quite pleased with the performance of this item. It did have a few shortcomings, but nothing too substantial. One thing that kind of bothered me a bit was the way you must change from station to station. It’s a very slow process, step by step up the dial. push button, 91.1, ad infinium. Very, very slow. from the closest preset you’ve programmed in. so this isn’t a big problem. If Asour were to double the length of the antenna lead, it would make a marked improvement in reception however. like my Chieftec does, it compounds the situation further. Granted, with all the pretty lights on the front panel of the VPC-1000, you really wouldn’t want it hidden behind a door, but what if that desk, and/or Chieftec case was the only one you own? As a CD/DVD-Rom, the unit performed flawlessly. The VPC-1000 is a bit of a “hit or miss” affair, with more “hits” than “misses” however. Perhaps it’s best point is that it’s able to operate independently from the PC it’s mounted in. Visually, it’s a very sharp item, and with the lights turned low, the display on the front is very attractive indeed. the FM tuner, clock, and more only using one drive space, it would be at home in one of those teeny Shuttle mini cases as well. feels like it could break if abused, even slightly. manuals, this product arrived with a manual printed in English only. For the suggested retail price of this item, they should (in my opinion) make sure they get the translation into that one language accurate. All in all, this is still a very good product. I’d like to thank Directron for sending it out. CPU: Pentium II 400MHz, Celeron 366MHz, AMD K6-2 400MHz or higher. OS: Windows 95/98/ME/NT 4.0/2000/XP, OS/2 warp, Novell, SCO Unix, Linux. Warning: This is a RPC-II DVD-ROM drive. The number of times you may change regional code setting is limited to five (5).